Click Start Event Printer to download and start the program. 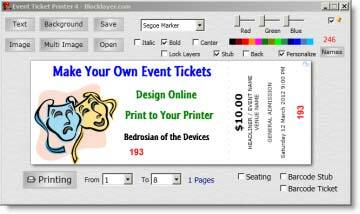 Design Event Tickets by adding text and images to create and save a Print File. Open this Print File and print tickets in batches, or send the print file to a Printing Company for Printing. No restrictions, trials or watermarks! Open this Demo Print File to see the format. 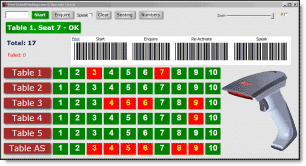 The pages are assembled from the printer in correct sequence for perforating, cutting and separating into books of consecutively numbered tickets, or by a Seating Plan. Once printed, use a sewing machine (no cotton!) to perforate the marked stub lines, and use a guillotine to cut the horizontal and vertical lines on the cut marks. Try printing a demo page to get an idea of the total time it will take to print all tickets on your printer. Keep images and backgrounds to a minimum to speed printing and conserve ink. To add images to tickets, right click the ticket, choose Add Image and select an image from your computer. Or right click an image on a web page (that you have permission to use), choose Copy then right click in the ticket designer and select Paste image. 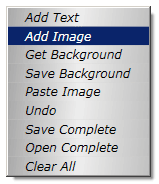 Drag, flip, mirror and rotate images by right clicking and selecting from the Menu. Roll Mouse-wheel to re-size. Right click and choose Add Text to enter text. Re-size with Mouse-wheel. Hit F1 for Key Combinations to add background colors and gradients to backgrounds. You can print Different Text on Each Ticket with individual Quotes, Sayings, Names, a Quiz or any text. Add Individual Text and matching Individual Images to Tickets. Add QR Codes to tickets Scan QR Code with phone to browse to a page or site with details relevant to your event. If your printer prints face down (some laser printers do, while inkjets print face up), select this option in the Printing dialog, to order the paper correctly.